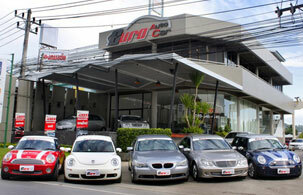 Euro Auto Car is the only showroom in Phuket selling second-hand European cars. Each of our cars has been selected because of its standard of quality, together with its low mileage. Cars in great condition, along with a superior after-sales service are what we provide our customers at Euro Auto Car. Euro Auto Car offers first-class luxury automobiles from Europe, including Mercedes Benz, BMW, Mini Cooper, Audi, and Volvo. All of our cars are thoroughly inspected by a great team of specialists. Those who like second-hand luxury cars, at worthwhile prices, are welcome to test-drive our latest cars. Second-hand luxury European automobiles with special promotions are only available in Phuket at Euro Auto Car.